General registration is $50 for all age levels, or you can register for $125 and receive an exclusive jersey (pictured below). NOTE: Registration with the exclusive jersey closes at the end of May. All online registration closes at 12:01 a.m. on Friday, July 5. Packets will be available for pick up from 11 a.m. to 5 p.m. July 5 at Syracuse Bicycle, 2540 Erie Blvd. East, Syracuse. (If you cannot make it to Syracuse Bicycle on July 5, you can get them on the day of the ride at Clear Path.) In-person registration at Syracuse Bicycle on July 5 is $65; day-of registration at Clear Path on July 7 is $75. The 50-mile ride will begin at 8 a.m.; the 25-mile ride takes off at 8:30 a.m. Participants should note that helmets and appropriate attire required. 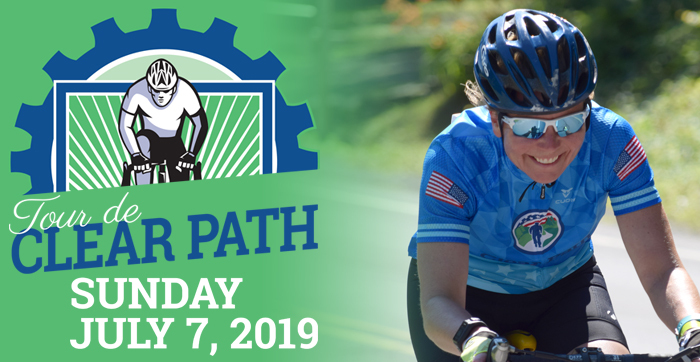 All riders understand that Clear Path for Veterans is at an elevation of 928 feet; both the 50-mile and 25-mile routes have a challenging ascension toward the end of the ride up to Clear Path’s facility on Salt Springs Road in Chittenango. Riders (or parents/guardians) will be required to sign a liability release. We will have an exclusive Tour de Clear Path cycling jersey (pictured below) available the day of the event for those who register at the 50 or 25 "Mile w/Jersey" level!